The air stone at the base of the aquarium breaks up the flow of air into the aquarium into a mass of bubbles. After a time the air stone can become blocked by calcification, especially in hard water areas, reducing the flow of air into the aquarium. 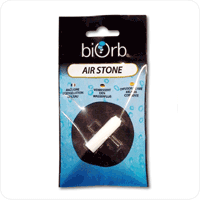 Replacing the air stone every few months will keep your aquarium bubbling away nicely.